I’m currently on research leave. Research leave is a wonderful and frightening thing. I’m working on a big research project about fairy tale and there just simply aren’t enough days to track down fairy crayfish, a frog who wears a magic hood of roses, a prince transformed into a dragon who wants to make pâté out of a princess… and that’s just d’Aulnoy’s corpus of fairy tales. Yet, how wonderful is it to spend one’s days with monkey princesses and disembodied hands? There’s been a couple of recent posts about Marina Warner and I was there at her MWF keynote too. I was also lucky enough to see an earlier keynote where she discussed the Arabian Nights and there, too, she talked about the themes of flying that run through the tales. As she talked about flying carpets, beds and mechanical horses, I couldn’t stop my mind straying as I thought about the fantastical flights in the tales of 17th century French authors like d’Aulnoy and Murat. 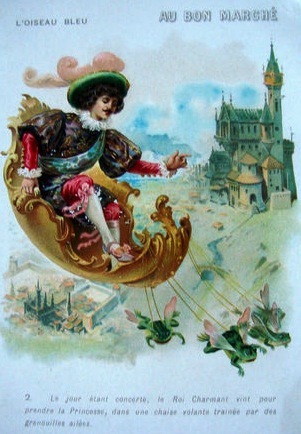 In d’Aulnoy’s “The Blue Bird,” King Charmant has a flying chariot drawn by winged frogs. The frogs are an early, magical GPS. They know the whole map of the world and can take him wherever he wishes to go. Charmant’s love, Florine, isn’t to be outdone. She is given magic eggs and one hatches a chariot-for-one, drawn by pigeons. Murat describes a particularly fabulous equipage in “The Savage.” The fairy, Obligeantine, defeated a giant who trespassed upon her kingdom and she took his skull, painted it a glossy black, and turned it into a chariot drawn by mastiffs with bat wings upon their backs. Is there anything quite so wonderful and gothic? Fairy tale flight has a wonder that will never cease to interest me. Well folks, I can die happy. That’s right, I met the Marina Warner on Sunday at her closing address for the Melbourne Writers Festival!! As she began to make her exit after her spectacular talk, I saw my opportunity. Unfortunately, my confident stride towards her quickly turned into a panicked run in the opposite direction. Meeting your idol is scary! Luckily, I had a second chance as she was signing copies of her new book afterwards. I now have her lovely signed book to put on my bookshelf and the memory of our little conversation (which mainly consisted of me grinning like an idiot and trying not to cry). At this closing address, Warner spoke about her latest book, Stranger Magic: Charmed States and The Arabian Nights. The book is a mixture of selected tales and critical pieces. We looked at some of the chapters earlier this year in our meetings and realised there was so much we didn’t know about this beautiful old collection of tales. I recommend reading the book! Warner explained that she was drawn to the Arabian Nights years ago while conflict in the Middle East was raging in Iraq and Afghanistan. She thought, ‘What can I do? I only write.’ But she saw that the Arabian Nights presented a very different vision of the Islamic world, one of love, magic and joy that she wanted to highlight in this time of conflict. I was delighted to hear of Warner’s personal experience of taking an old worn manuscript of some stories from the Arabian Nights out of its acid free box and the incredible smell that wafted out: ‘the smell of hands and breath still in the manuscript.’ How exquisite! I’ve always wondered about the fact that in the frame tale to the Arabian Nights, Shahrazad must stop her storytelling at dawn, that there is no more talking when the sun rises. Also interested by this fact, Warner discovered the reason through a friend: ‘The night is profane, the day is sacred. The night is for ourselves, the day is for God.’ Thus, storytelling can only occur during the night. I just love this. Warner also revealed her favourite tale in the collection, Doctor Douban, which she beautifully recounted for us in her lovely British accent! A particular aspect of the Arabian Nights that Warner focussed on was the theme of flying. The most familiar image to Western readers is most definitely the magic flying carpet. (As a child I used to pretend our living room rug was flying while I sang – badly – ‘A Whole New World’ from the Disney movie, Aladdin.) But there are also flying jinn, giant birds, and humans on flying beds and mechanical horses. The idea of flight is central to the collection and as Warner remarked so beautifully, it is symbolic of our imaginations taking flight, the freedom, the possibilities. At one point in her address, Warner asked, ‘Do tales of enchantment still communicate something valuable?’ After hearing her speak so passionately about this collection of tales, I can tell you that they most certainly do.